Southern Matriarch: I love Linen continued..
Well I didn't get to stitch as much as I wanted today, but I did get one little section done. Have I mentioned that I love linen? 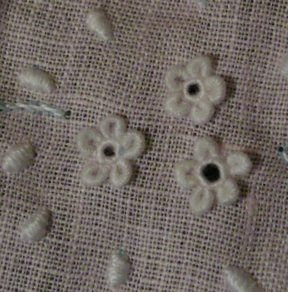 I hope that my eyelets will get better as I go along, but I love these teeny bullion loop flowers. Cannot wait to see it when you are finished. I think it needs some drool.... love those bullion loop flowers. I could add the drool to the iron water!!!!!! I LOVE those bullion flowers with the teeny tiny eyelets. Mirella does a great job of those. Like doing them her way much better than doing the running stitch around them.